Nikon Upright Microscope Eclipse Ni-E | EINST Technology Pte Ltd. 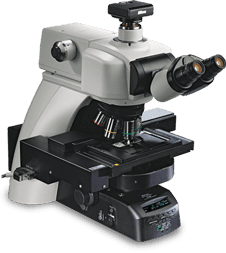 The culmination of years of innovation and optical refinement, Nikon’s Eclipse Ni-E upright research microscope incorporates a revolutionary modular design that allows easy expansion and precise system customization. All-new CFI Plan Apochromat Lambda objectives with Nano Crystal Coat technology yield brighter, higher resolution images with higher transmission rates. Add enhanced widefield and spot laser illumination capabilities with motorized modular components, and you have a truly evolved research microscope that can take on limitless applications. multi-mode system expandability to suit a vast range of imaging possibilities. The proprietary “stratum structure” design and expandable infinity space enables the addition of multiple turrets, detectors, laser inputs and other accessories. The Ni-E is also configurable for multiphoton imaging, as well as fixed-stage configurations to meet the demands of neuroscience applications. Ni-E (focusing nosepiece) configured with back port unit, motorized epi-fluorescence illuminator, two high-sensitivity cameras, motorized stage and motorized quadrocular tilting tube. Ni-E (focusing nosepiece) configured with photoactivation unit, motorized epi-fluorescence illuminator, high-sensitivity camera, motorized stage and motorized quadrocular tilting tube. To meet the need for more versatile experiment techniques, more motorized options, such as filter wheel, high-speed shutter and photoactivation unit, are now available. Condenser, aperture and field diaphragm, and ND filter are automatically set to the optimal position during objective changeover. In addition, stage XYZ travel amount per handle rotation and parfocal distance deviation correction are automatically adjusted. Microscope settings can also be manually adjusted. Observation methods such as brightfield, DIC, phase contrast and fluorescence can be set via programmable buttons, enabling changes to be made at the push of a button. This is particularly useful when the same sample is imaged with multiple observation methods. High-precision Z-focus provides accurate height information required for use with confocal laser microscopes. Individual coarse and fine focus knobs provide enhanced ease of operation. The Ni-E incorporates a number of Nikon innovations that provide unsurpassed optical performance. A “fly-eye” lens array is built into the transmitted light illumination optics to ensure uniform brightness to both eyepieces and digital detectors. The “fly-eye” lens is ideally suited to diascopic illumination optical systems. Nikon’s proprietary noise terminator mechanism is employed in the epi- fluorescence cube turret and filter cubes. The S/N ratio has been dramatically improved by thoroughly eliminating stray light in the filter cubes, allowing images of weak fluorescent signals to be captured with high contrast and brightness. This anti-reflective coating consisting of nanometer-size particles is based on semiconductor manufacturing technology and is also used for Nikon camera lenses. The coarse structure with particles arranged in a spongy construction with uniform spaces between them enables extremely low refractive indices. With remarkably high NA, greatly improved transmission in the long wavelength range thanks to Nikon proprietary Nano Crystal Coat, and chromatic aberration correction over 435 to 850 nm, these objectives are ideally suited not only for brightfield and DIC observations but also for fluorescent observations. These lenses allow acquisition of bright and clear images at any wavelength for near-IR imaging and multi-color fluorescence imaging. Because bright images can be captured even with a weak excitation light, damage to a specimen is minimized. The Ni-E can be controlled in conjunction with a Digital Sight series digital camera, facilitating effortless digital imaging. Images can be captured with a dedicated button on the microscope body, the touch panel on the camera control unit, or the software GUI on a PC, depending on your preference. Images can be acquired by simply pressing the image capture button located on the microscope base, without removing your eyes from the eyepieces. A wide array of Nikon digital cameras offering with high sensitivity, high resolution, high speeds and faithful color reproduction are available to meet all research needs and purposes. Nikon’s NIS-Elements imaging software employs a single platform to allow stress-free operations, from image capture through to comprehensive control of camera, microscope and peripheral devices, to image processing, measurement, data management and analysis. The Ni series employs a modern, organic design in the microscope wing that adds a gentle beauty while reducing stress during lengthy observations. When designing the Ni series, Nikon collaborated with Akio Shindate, previously involved in the design of Nikon SLR cameras from the early stage of concept building. Through this collaboration with Shindate, who excels at unique ideas and stylish designs, Nikon has produced innovative new microscopes that combine function with beauty. When using layered epi-fluorescence cube turrets, or layered epi-fluorescence cube turret and motorized barrier filter wheel, F.O.V. is 22.